And now people are offering free hugs in public! It's just so brazen. We are living in increasingly embracive times. As an old-fashioned Englishman, I am not happy about this. Where once a cordial 'Good day, sir,' sufficed, a hug is now de rigeur; where a professional handshake was as physically close as one ever needed to be, a full embrace is now expected, nay, demanded. Mark my words: it's overbearing, unhygienic and a veritable minefield of social awkwardness. I therefore implore you to lay down your arms and reject this embracive erosion of the social norms that have loyally repressed us for centuries. Bring back the stiff upper lip, the aloof nod of acknowledgment, and (for when things get really raucous) the friendly shoulder punch. I thank you. This why, people. This is why. I hug family, friends, people I love, or those who reach out to me. Otherwise, no. 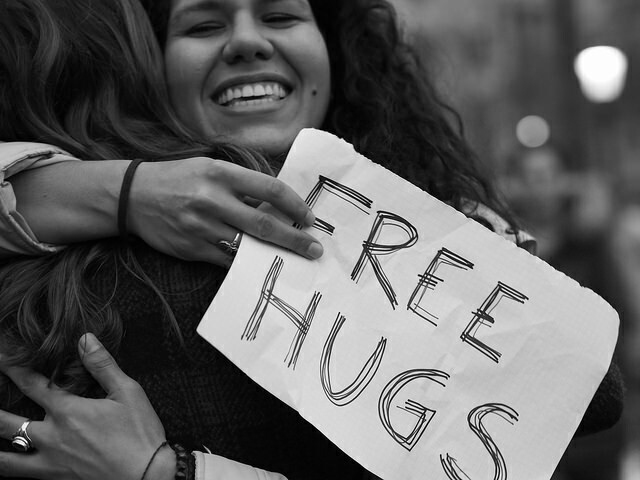 Hugging is a good thing--but only if one is invited to do so. Here you may imagine me punching you in the shoulder with a hearty American "howdy." Great Post!! Free hugs for everyone. People hug piers like they don't hug their significant ones. I witness this at work and it baffles me. I wonder how much of that hugging is to create (as in force) a bond they don't necessarily... can't... shouldn't... feel?! That and the noisy back pat. Too much and for so little reason. Sending virtual hug to you and hoping you're having a wonderful and healthy time.